Mars is the fourth planet from the Sun, and is located between Earth and Jupiter. It is named after the Roman god of war, because of its reddish color in the night sky. The planet is smaller than Earth and colder since it is further from the Sun and has a very thin atmosphere. Mars rotates around the Sun following an eccentric orbit. Since Mars is twice the distance from the Sun as the Earth, the Martian year is twice as long. However the Martian day has approximately same duration as Earth's due to its similar axial rotation. Mars is the most Earth-like planet in the Solar system. A few billion years ago water even flowed on its surface! Imagine a frozen Earth desert with reddish sands and a pink sky. The surface looks reddish because high amounts of iron. The landscape has all sorts of landforms similar to Earth: valleys, plains, mountains and large volcanoes. The highest mountain in the Solar System is located on Mars. The mountain, Olympus Mons, is of volcanic origin and raises 86,600 feet above the average surface level, about three times higher than Mount Everest! While some areas are heavily covered with craters, formed by asteroids and comets smashing into its surface, others are smoothed by lava flows. The cracks and canyons are probably the result of past "marsquakes". There are also huge valleys, like Valles Marineris, many times larger than the Grand Canyon on Earth. Scientists were excited to find what appear to be large river channels, formed by ancient water flows. What happened to the water? This question is still quite puzzling. It may have escaped into the space or still lies frozen in the soil in a form of "permafrost." Mars also has ice caps at its North and South poles. Mars has a thin atmosphere that consists mainly of 95% carbon dioxide, nitrogen, oxygen, water vapor and argon. This Martian atmosphere is about 100 times less dense than the atmosphere surrounding Earth. The atmospheric pressure on the surface is less than one percent of the Earth's at sea level. The average temperature ranges from -55 C to -67 C, however it varies according to the seasons. During the summer, when the polar caps melt, the solid carbon dioxide or dry ice turns into gas and substantially raises the atmospheric pressure by 25 percent increasing the surface temperature. NASA is very interested in learning more about the possibility of life on Mars, and so has been developing a series of spacecraft to orbit and land on the surface. Eventually, the plan is for people to visit! NASA first sent the Viking spacecraft to orbit and land on Mars back in the 1970's. Launched in 2001, NASA's Odyssey spacecraft is still in orbit around Mars and has collected over 130,000 images. Odyssey also determined that radiation in low orbit is twice the radiation in low earth orbit. Radar measurements of the South pole, made by Mars Express (an international collaboration launched in 2003), show that there is enough ice to cover the planet with water 11 meters deep if the ice melts. In 2005, NASA's Mars Reconnaissance Orbiter was launched carrying the most powerful camera ever to be used in such a mission. In fact, the camera is so powerful that it can zoom in on surface objects as small as footballs. The latest data from these missions proved that liquid water did flow on Mars and may still exist there. The abundant amount of water, probably gradually froze when tectonic and volcanic activity on Mars stopped a few millions years ago. Due to the success of Spirit and Opportunity, two robotic geologists or land rovers that landed on the Martian surface in 2004, NASA's next international collaborative rover mission to Mars is scheduled for 2012. This new larger rover with enhanced instruments for gathering more scientific data is called the Mars Science Laboratory. It will be able to collect samples of rock and debris from the surface and analyze the samples on board, hence the name Mars Science Laboratory. Mars also has two tiny moons, named Phobos and Deimos after Greek gods of fear and panic. These moons are small and lumpy, and look like asteroids. 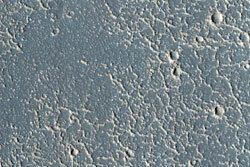 Scientists think that they were probably captured by Mars from an asteroid belt. 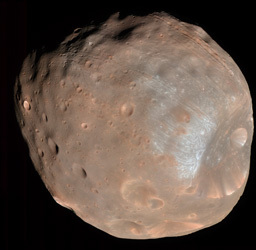 Phobos has a diameter of about 22 km and orbits above the Martian surface at about 6000 km. Phobos is the closest moon to its planet in the entire Solar System. Because it is so close it rises and sets twice a day from west to east. The smaller and outermost moon, Deimos, has an average diameter of 12.6 km and orbits about 23.5 km from Mars. One of the most famous features on Mars is Cydonia, known as 'The Face on Mars'. 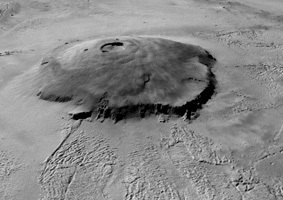 It was first photographed by Viking's Orbiter 1 in 1976 when searching for suitable lending sites. 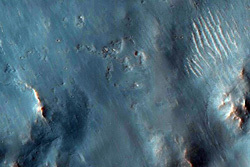 The low resolution images of this hill region resembled a human face and were basis for many speculations that the hills were artificially made. 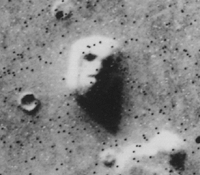 However, recent more detailed images of Cydonia, transmitted by spacecraft with higher resolution cameras prove that "the face" is a result of shading, low resolution photos, high landforms called mesas, and human imagination. In 1886, the American astronomer, Percival Lowell built an observatory to study Mars. He observed features that resembled channels and falsely concluded that intelligent beings live there. Violent dust storms, driven by winds, sometimes envelop the entire planet and we can't distinguish any surface features. The same winds, however, have prolonged the life of two Martian rovers, Spirit and Opportunity, because they sweep the dust from the solar panels allowing them to recharge over and over. 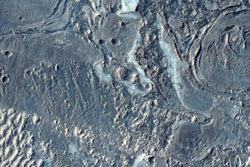 The twin rovers still continue to send images of Martian landscape. 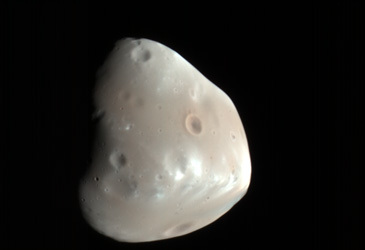 Phobos and Deimos have chemical compositions similar to the dark carbon-silicate rich asteroids. However, their density is lower than pure rock found in asteroids. This makes scientists think that they contain some ice and may have originated from the outer Solar System instead of the asteroid belt. Nevertheless, they are very small and could be used as space stations for futures flights to Mars. A huge volcanic mountain located on the west side of the Tharsis region on the planet Mars, Olympus Mons is three times taller than Mount Everest. It was discovered from photographs taken by Mariner 9. Earth's highest mountain, with a peak of 8,848 meters and located in Nepal, near the border with Tibet. Objects in the Solar System which orbit the Sun, but are too small to be considered planets. Ceres, the larges known asteroid, has a diameter of just under 500 kilometers. A system of canyons on the surface of Mars that is 4,000 kilometers long by 2 to 7 kilometers deep. The largest canyon in the United States, about 450 kilometers long and located in the state of Arizona. A colorless and odorless element, it's the third most common gas in the Earth's atmosphere. A Mars mission launched on June 1976 by NASA, and consisting of both an orbiter meant for mapping of the planet, and a lander which took panoramic photographs of the planet and searched for evidence of life. The 2001 Mars Odyssey is a robotic probe launched by NASA in 2001 with the purpose of looking for evidence of volcanic activity and water on the surface of Mars. It was launched in 2001 and is still functioning and orbiting Mars. Launched by the ESA on June 2003, Mars Express and its lander, the Beagle 2, were tasked with examining the biology and geology of Mars. Contact with the Beagle 2 was lost shortly after landing, but the Orbiter has been able to continously conduct measurements of Mars since early 2004. MRO's mission goals were to view the surface of Mars at as high a resolution as possible from orbit to help NASA better understand about landing sites for the rovers Spirit and Oppotunity. MRO launched on August 2005 and has returned extremely high resolution photographs of the surface of Mars, subsurface data and measurements of the temperature and water vapor levels in the Martian atmosphere. Presently scheduled to launch late 2011, the MSL is a NASA mission that will carry direct onboard chemical analysis of Martian soils and ground rock powders, and look for organic and carbon compounds. The largest of the two moons of Mars, measuring 26.8 x 22.4 x 18.4 kilometers. It was discovered in 1877 by American astronomer Asaph Hall. The smallest and outermost of Mars's two moons, it measures 15 x 12.2 x 10.4 kilometers. 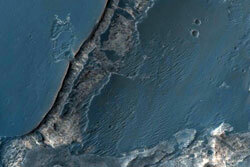 A region on the planet Mars, famous for being the location of the geological formation known as the "Face on Mars." The Viking 1 mission, launched in 1976 by NASA, consisted of a two-part unit: a lander designed to take Martian soil samples and send the data back to Earth; and an orbiter which carried the lander and took photos of the surface of Mars. Description Floor of Valles Marineris near Sulfate Outcrops in Tithonium Chasma, October 2010. Description Blocky Deposit on Floor of Melas Chasma, October 2010. Description Close up of floor of Echus Chasma, November 2010. Description Layered deposits in Candor Chasma, October 2010.